Stanley Park is located in Vancouver, British Columbia. It's one of Canada’s most famous city parks and is a wonderful place to observe nature at any time of year. 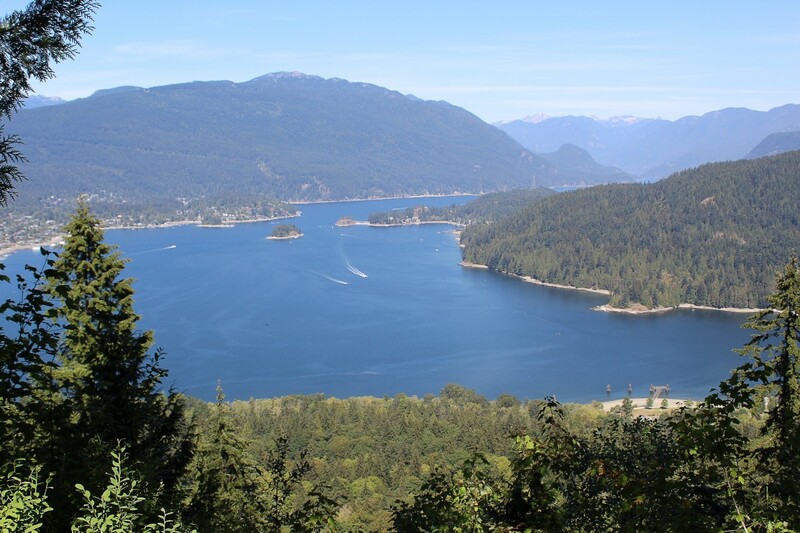 The park is located on a peninsula projecting into Burrard Inlet and occupies an area of 405 hectares (1000 acres). It contains a variety of habitats for walkers to explore: carefully tended grass with cultivated flowers, shrubs, and trees, a seawall path which offers great views and access to both rocky and sandy beaches, and trails through forests filled with hemlock, cedar, and fir trees. Many different animals can be found in each of the habitats. Stanley Park is beautiful in winter as well as summer. 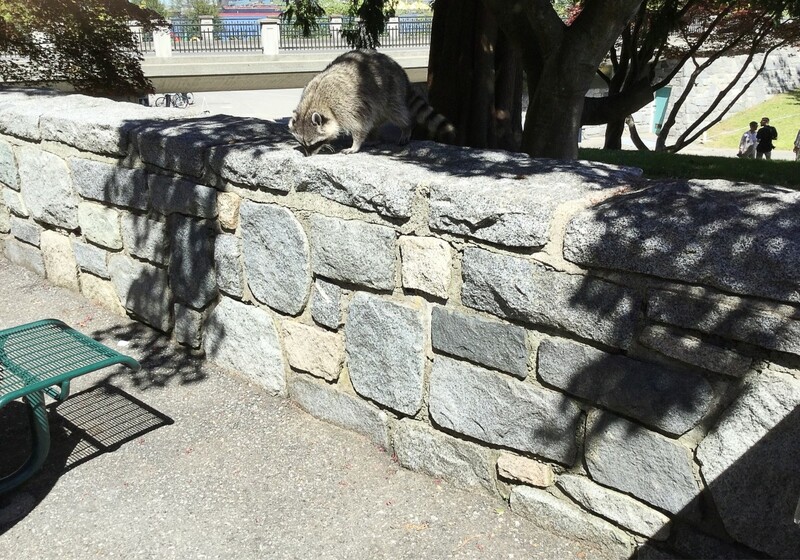 The mild weather in Vancouver means that many animals are active all year long. Evergreen plants are beautiful at any time. Buds and catkins open early in the year when many other places in Canada have snow. 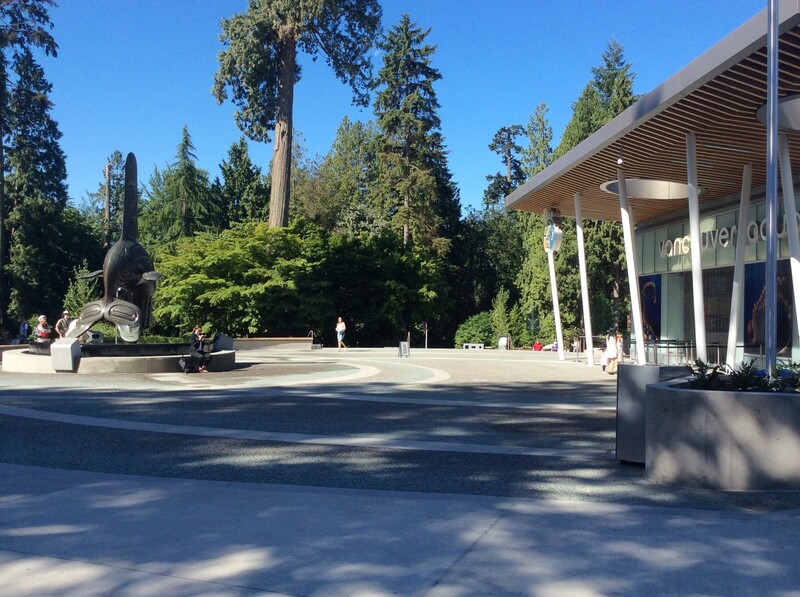 The Vancouver Aquarium is located in Stanley Park and is open throughout the year. The park also contains some interesting landscape features that can be appreciated throughout the year. 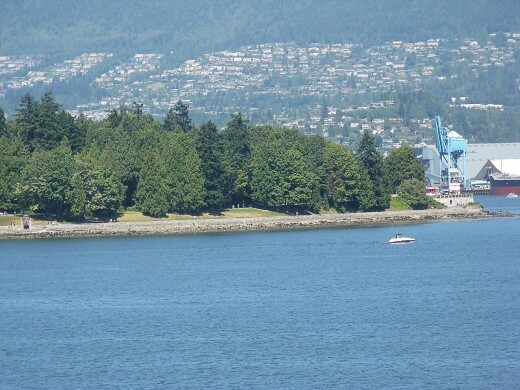 Stanley Park is located on a peninsula that juts out into Burrard Inlet. Stanley Park is a wonderful place to take photos. I always have a camera with me when I visit the park. Unless otherwise stated, all of the photographs in this article were taken by me. 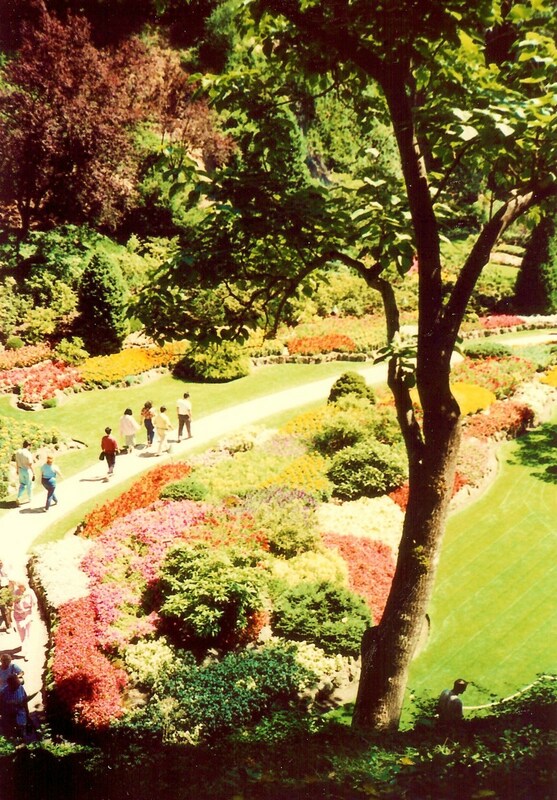 Stanley Park was opened on September 27th, 1888. It was named in honour of Lord Stanley, who was the Governor General of Canada at the time. 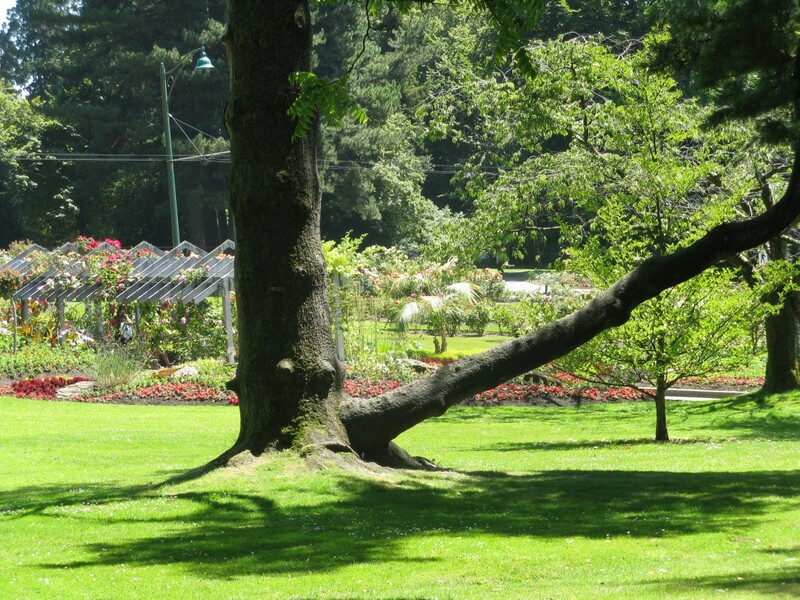 The park is easily reached from downtown Vancouver by walking, cycling, or driving. Buses also travel to the park. A link to a trip planner for people travelling by public transit is provided in the "Reference and Resources" section below. Stanley Park offers playgrounds, picnic areas, miniature train rides, rides in horse-drawn carriages, a water park, and an outdoor swimming pool. It also contains interesting landmarks such as totem poles, Siwash Rock (a 32 million-year-old sea stack), a large western red cedar tree with a hollow trunk, and many monuments and sculptures. 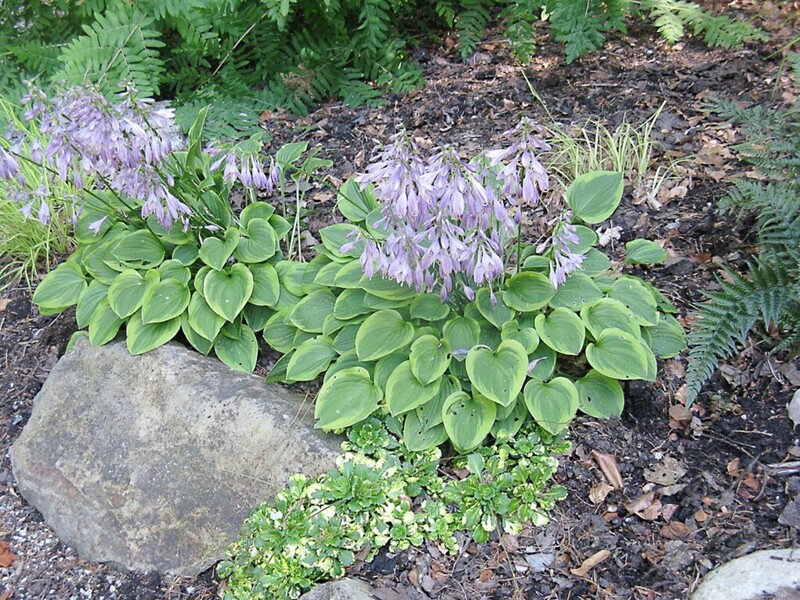 One of Stanley Park's most important functions is to act as a nature preservation area. The park is large enough to contain areas for both nature study and recreation. It's known for its natural habitats containing wild plants and animals as well as its cultivated areas and the Vancouver Aquarium. The aquarium contains many other types of animals besides fish. The Stanley Park seawall travels around the perimeter of Stanley Park. The path on the seawall is 8.8 km (5.5) miles in length and is a very popular walking, cycling, and inline skating route. The path travels by both rocky and sandy beaches. The sandy beaches are nicer for sunbathing but the rocky beaches have the most wildlife. If you walk on a rocky beach and lift up a rock in the intertidal zone you will probably discover little shore crabs. They quickly scuttle away to hide when they're disturbed. I've never been able to photograph a living one. The crabs are just a few centimetres wide—a 5 cm specimen is a giant—and are green, yellow, grey, red, brown, or purple in colour. Shore crabs feed mainly on diatoms (unicellular algae encased within a silica shell), sea lettuce (a type of green seaweed), and other green algae. They may also scavenge animal remains and eat animal eggs. Rockweed is a very common brown seaweed that coats the rocks on the seashore. 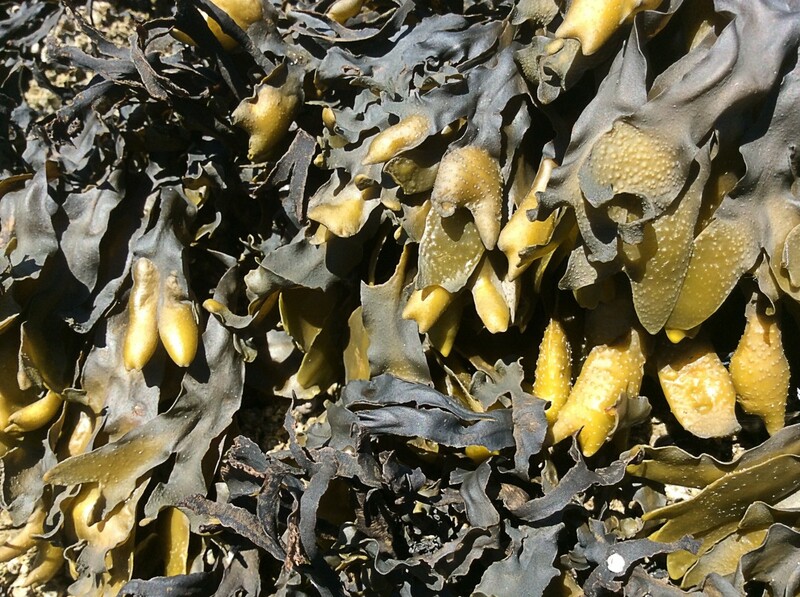 The blades of rockweed have inflated bulbs at their tips. 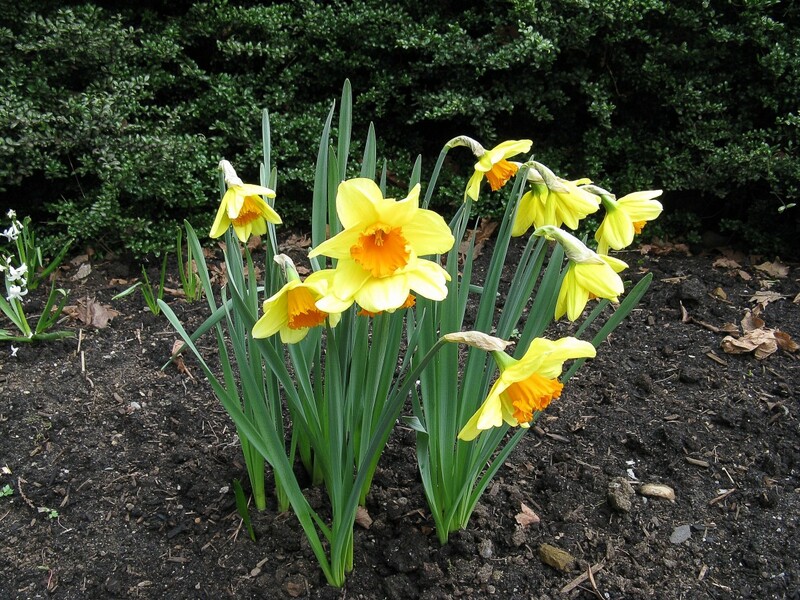 The bulbs contain gas, which enable the blades to float or stand erect when the tide comes in. This orientation exposes the blades to more sunlight than they would receive if they were flattened under the water. This is important for the seaweed because it makes its food by photosynthesis, which requires light energy. Rockweed bulbs have bumps on their surfaces at certain times of year. The bumps contain reproductive structures, which release the male and female cells into the water. After the cells join, the fertilized egg forms an embryo that attaches to a rock and grows into a new seaweed. 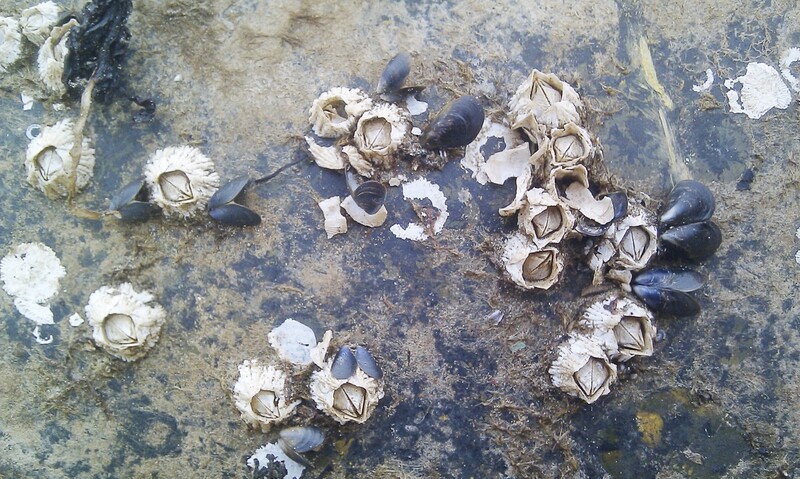 Another common sight on the rocky beaches of the park is the acorn barnacles. Barnacles have plates at the top of their shells that open when the animals are immersed in water. The plates act like trap doors, allowing feathery appendages to emerge. The appendages rhythmically sweep tiny creatures into the animal for it to eat. If you look for barnacles that are covered by shallow water, you should be able to see this feeding action. Acorn barnacles are firmly attached to their substrate. When the tide is out, their shells are tightly closed to prevent the animals from drying out. The barnacles are numerous in the intertidal zone. Although it's difficult to do, I try to avoid standing on the animals as I climb over rocks. 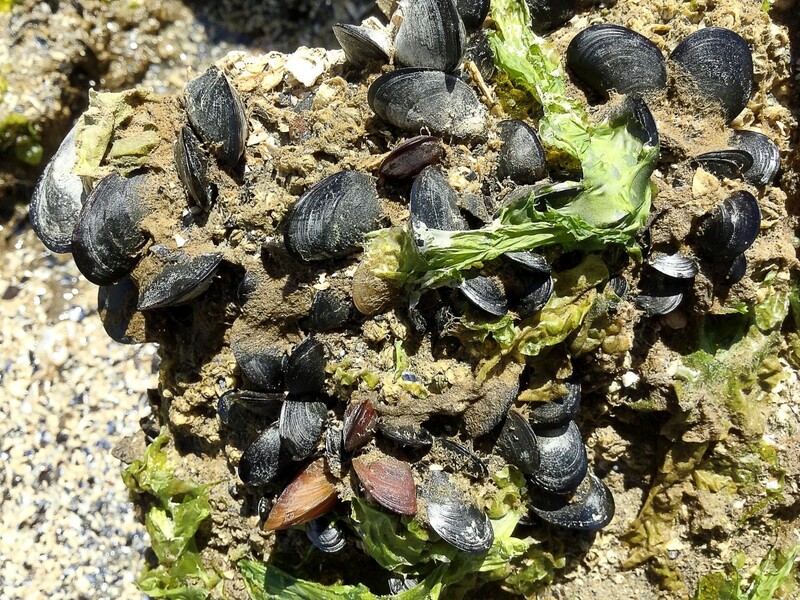 California mussels are a common sight on British Columbia shores. They are found from the coast of Northern Mexico to Alaska. Their shells are black in colour. The thin, outer, and brown layer known as the periostracum may be seen on some animals, however. The mussels are attached to their substrate by strong byssal threads. The animals are filter feeders. Their main food is phytoplankton, which are tiny plant-like organisms found in seawater. The water enters the mussel through the incurrent siphon, flows over the gills, where the plankton is trapped, and then flows out through the excurrent siphon. 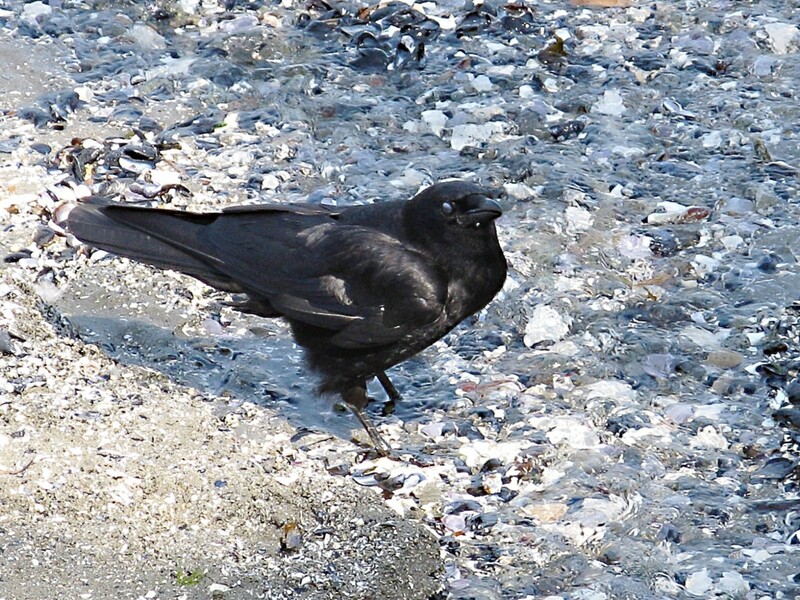 Three common birds seen on the beaches of Stanley Park are the glaucous-winged gull, the northwestern crow, and the great blue heron. Since 2001, great blue herons have nested in trees outside the Vancouver Park Board's office at the edge of Stanley Park. 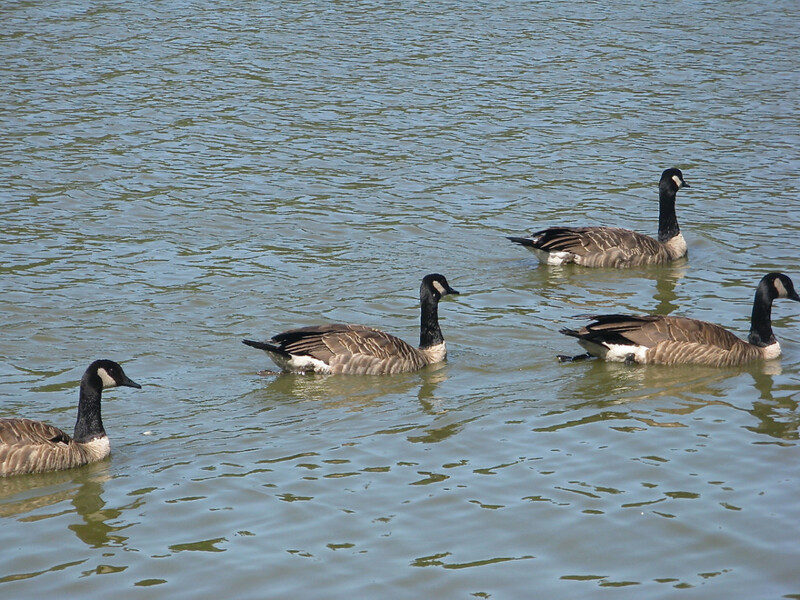 The birds are often seen fishing in the park. 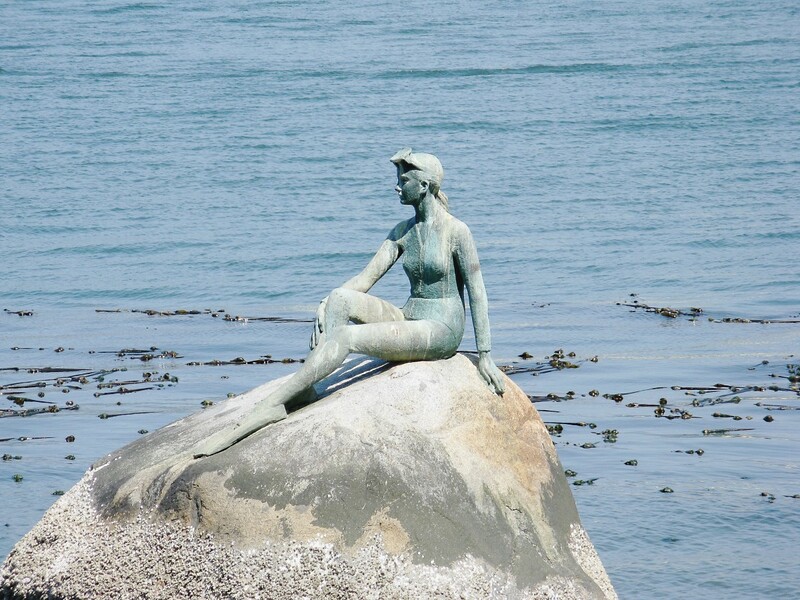 You may also discover other creatures on the Stanley Park shore, including limpets, clams, periwinkles, ribbon worms, sea stars (starfish), sea cucumbers, and green and red seaweeds. Their visibility depends on the habitat and on how low the tide is. In the subtidal zone the floats of bull kelp can be seen bobbing on the water surface. From the beach you may see swimming or diving cormorants and ducks. If you’re interested in seashore life, it’s important to look at a tide table for the day of your visit to see when low tide is occurring and how low it’s going to be. The lower the tide the greater the variety of seashore animals and seaweeds that will be visible. 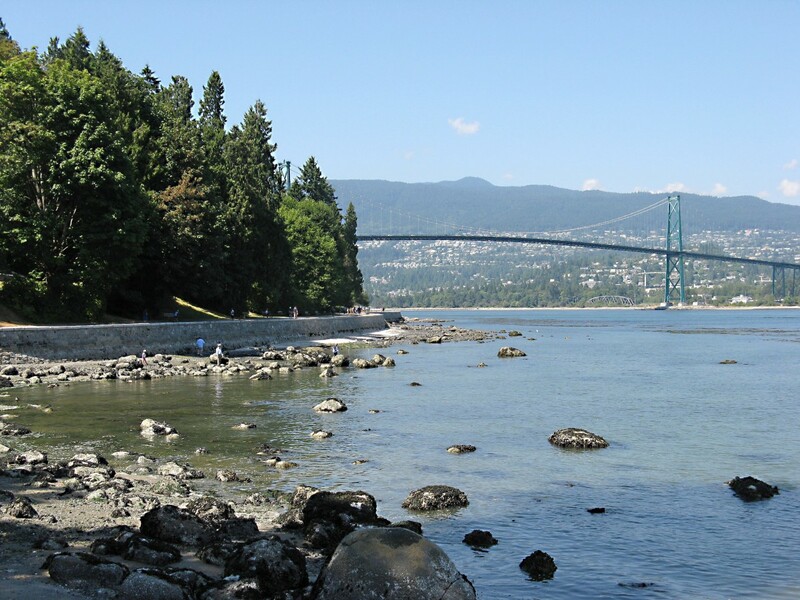 In addition to the cultivated area of the park, the seawall, and the beaches, Stanley Park has several other attractions for nature enthusiasts. Most of the park is covered by forest. Squirrels, raccoons, skunks, and coyotes may be seen from the forest trails or, in the case of skunks, smelled. The squirrels and raccoons are confident animals and are also found in the cultivated sections of the park. Beaver Lake is a natural body of water located near the centre of the park amidst the trees. It's a popular site for waterfowl, frogs, and human visitors. It also contains fish. Bald eagles patrol the sky around the lake. Barred owls, little brown bats, and northern flying squirrels visit the lake area at night. In addition, beavers can sometimes be seen in or around the lake, as the name of the lake suggests. Beaver Lake is gradually being filled with soil, plant debris, and water lilies in a natural process. It's estimated that if this process continues the water will have gone within about twenty years. 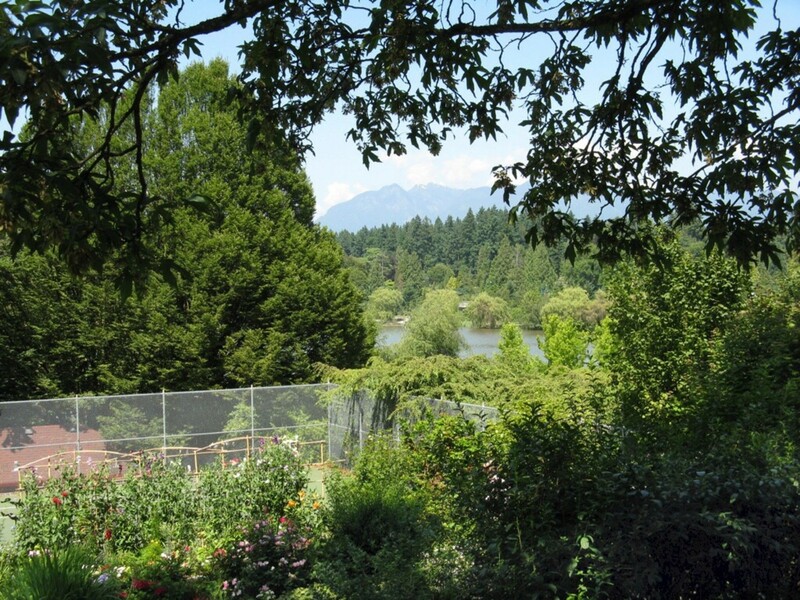 The Vancouver Park Board Is planning a restoration project for the lake, however. Lost Lagoon is located near the main Stanley Park entrance, on the left side of the road if you are approaching the park from downtown Vancouver. 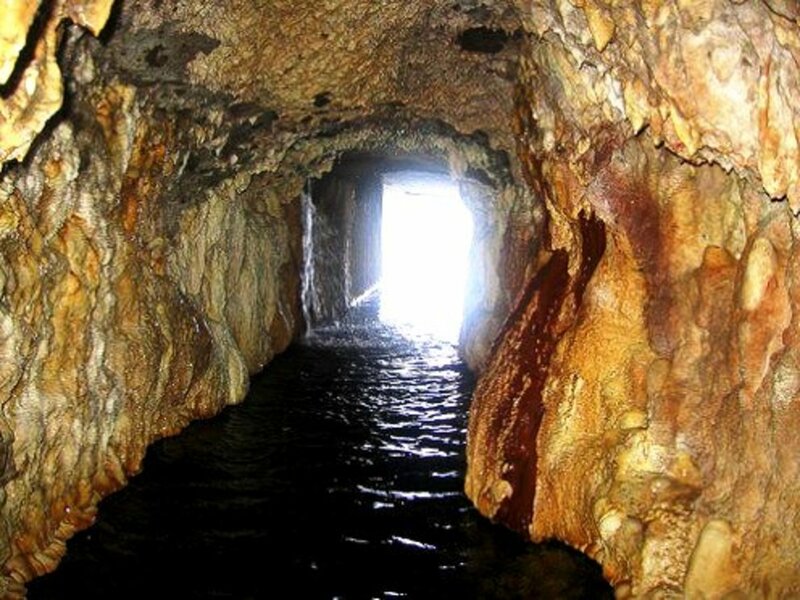 It contains fresh water today but was once fed by ocean water travelling with the tide from Coal Harbour. The lagoon is now separated from the harbour by the causeway that passes through Stanley Park. 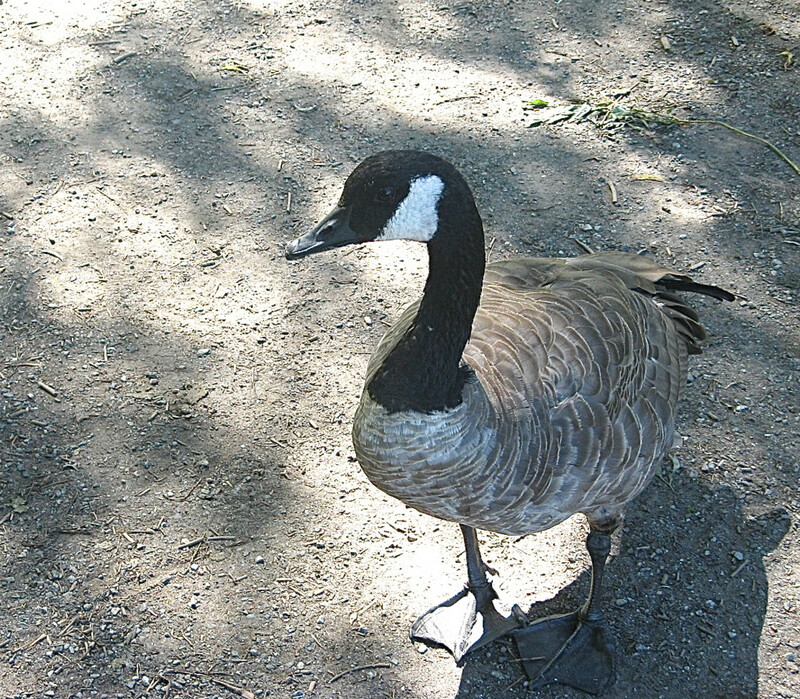 Lost Lagoon is a bird sanctuary. 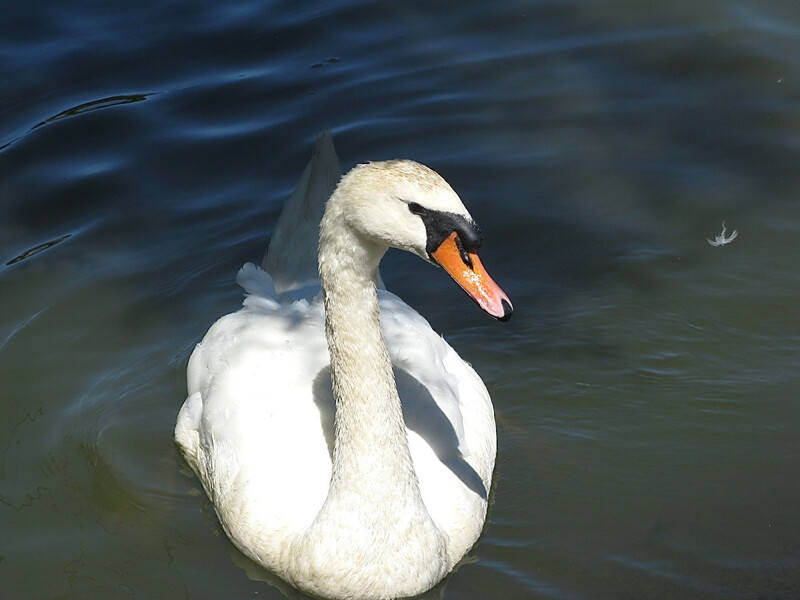 It contains waterfowl and until quite recently contained mute swans as well. Many other types of birds visit the trees and shrubs that border the lagoon and the trail that travels around the lagoon. The Lost Lagoon Nature House has nature displays and information to educate and entertain visitors. The nature house is run by the Stanley Park Ecology Society and is located in the former boathouse at the southeast corner of Lost Lagoon. 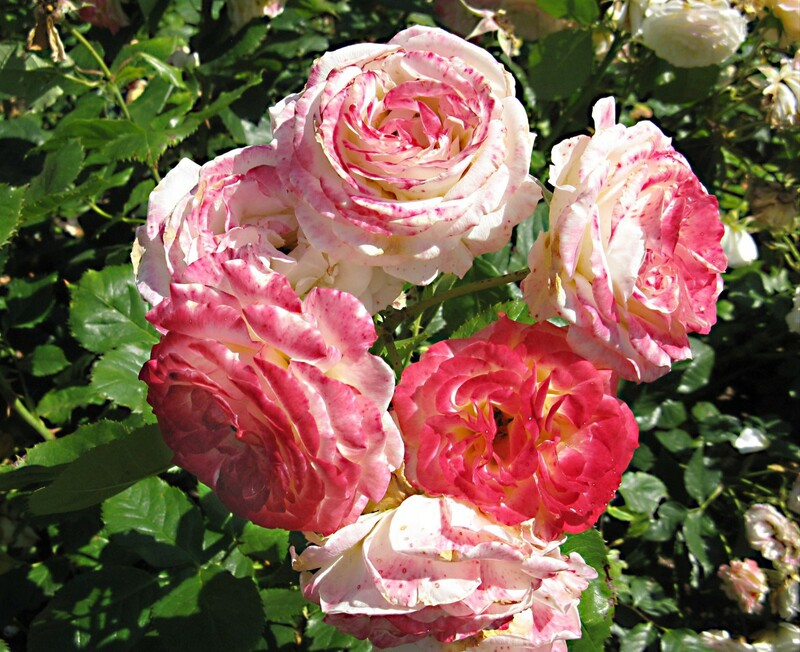 The Stanley Park Rose Garden contains around 3500 rose plants as well as many other attractive ornamental plants. The garden is located next to the Stanley Park Pavilion, a historic building erected in 1911 that is now a restaurant. 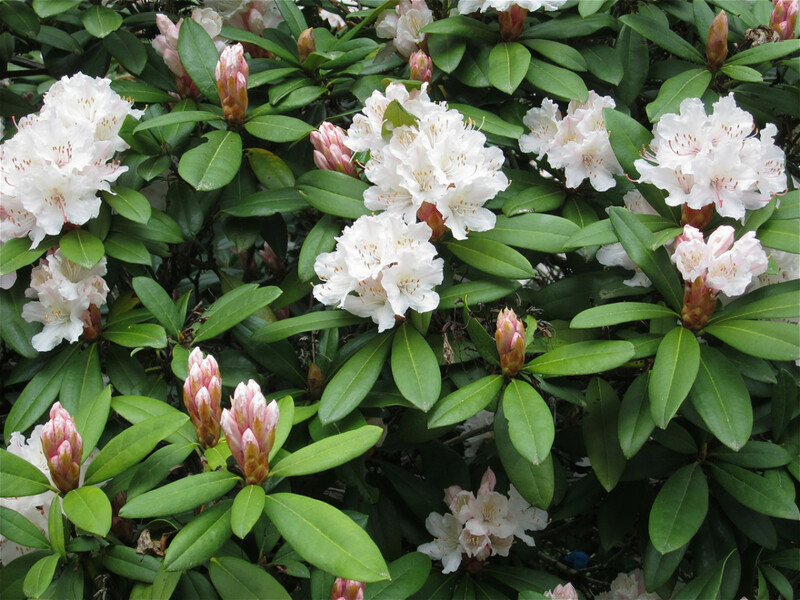 Stanley Park also contains a rhododendron garden as well as flower beds distributed throughout the cultivated part of the park. 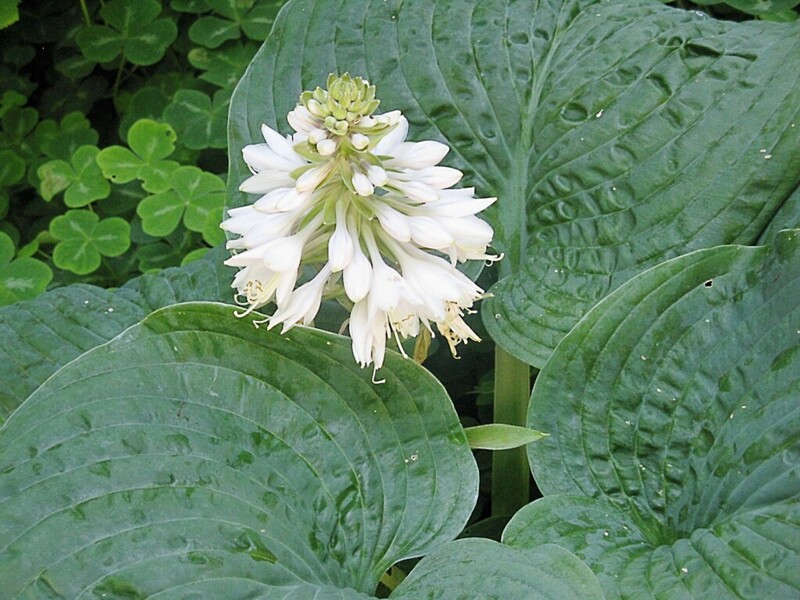 The plants are attractive to look at all year, but a late spring, summer, or early fall visit is needed in order to see most of the flowers in bloom. The Shakespeare Garden is located next to the rose garden. 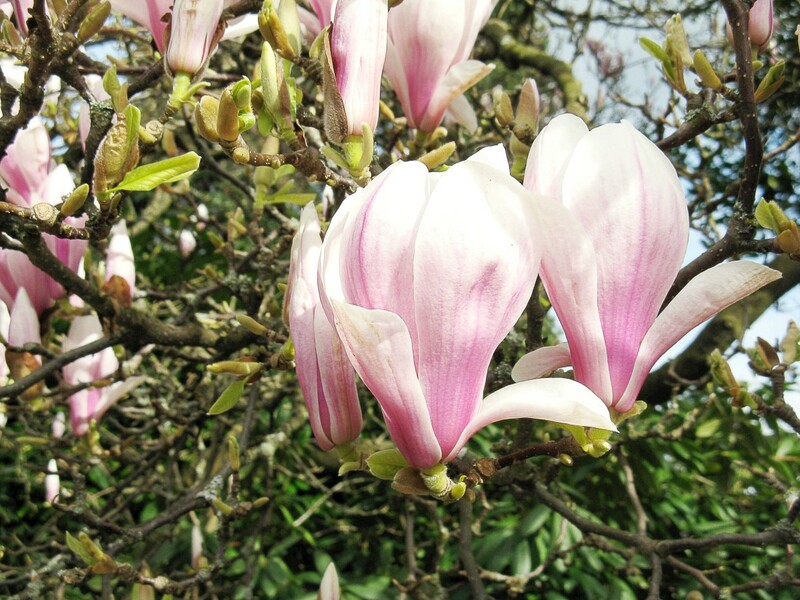 It's an arboretum containing trees mentioned in the works of William Shakespeare. Plaques with the relevant quotes are placed on the appropriate tree trunks. Besides being attractive, the arboretum is a nice place to cool down on a hot day. The Vancouver Aquarium is the largest public aquarium in Canada. It has a large collection of tropical and temperate fish and invertebrates, including sharks, as well as amphibians, reptiles, birds, and mammals. Some mammals at the Vancouver Aquarium are sea otters, sea lions, dolphins, and porpoises. Until recently, the aquarium also had a display of Beluga whales. The display of captive cetaceans (whales, dolphins, and porpoises) is being phased out, however. The stated goals of the aquarium are animal conservation, public education, and research. The aquarium holds daily feeding shows in which information about the animals is shared. 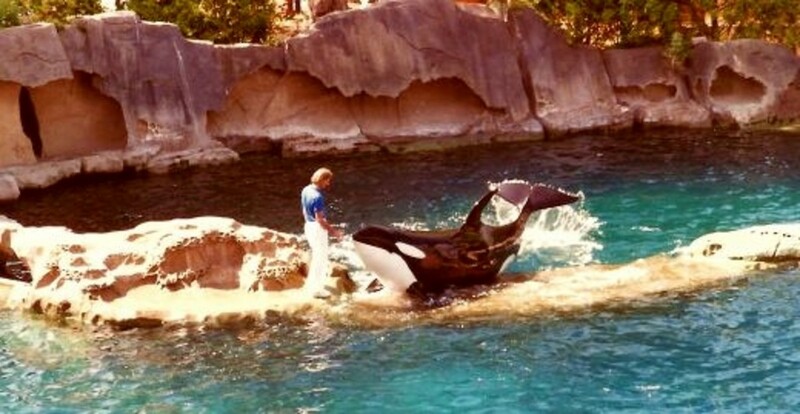 Over the years the shows have gradually changed from showing animal tricks to demonstrating much more natural behaviors and educating the viewers as they watch the demonstration. The aquarium offers a wide range of school programs. It also cares for rescued marine animals until they can be released back into the wild. The Vancouver Aquarium has a gift shop, which people can enter without paying for an aquarium visit. It also has a café and a snack bar to serve people who are hungry during their visit. The café has a section that can be accessed from outside the aquarium. The aquarium's food is expensive, however, so it might be better to eat elsewhere. In summer, the Stanley Park concession stands are open. The park also contains other restaurants. 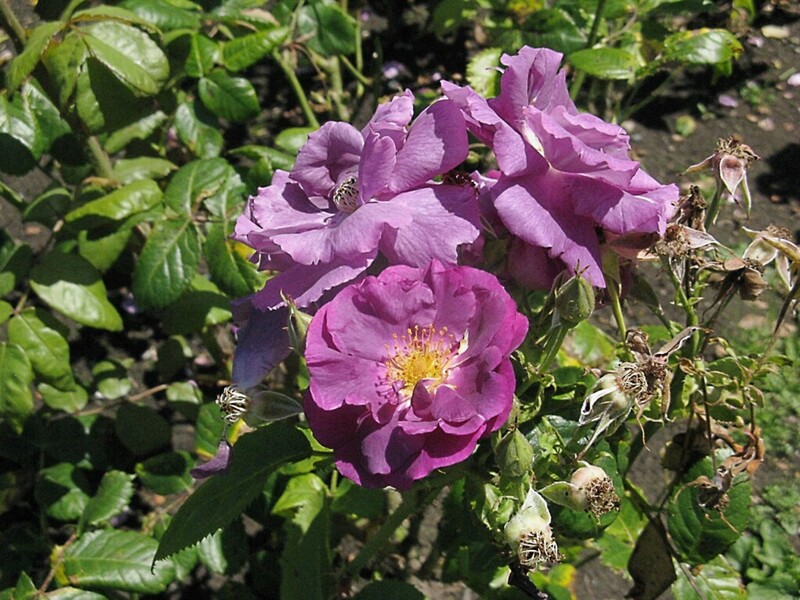 I think that purple roses are beautiful. 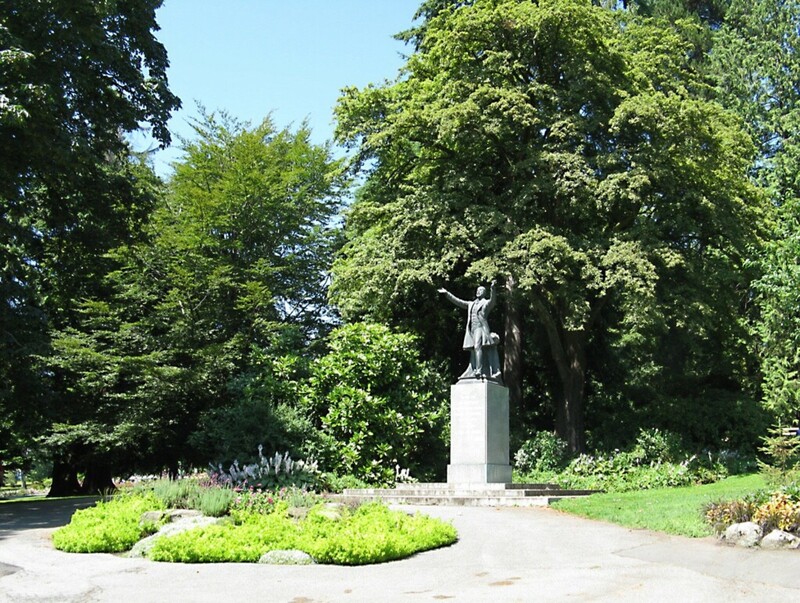 Lord Stanley welcomes visitors to Stanley Park. Stanley Park is a wonderful park for nature lovers to visit, but not everyone can visit Vancouver. 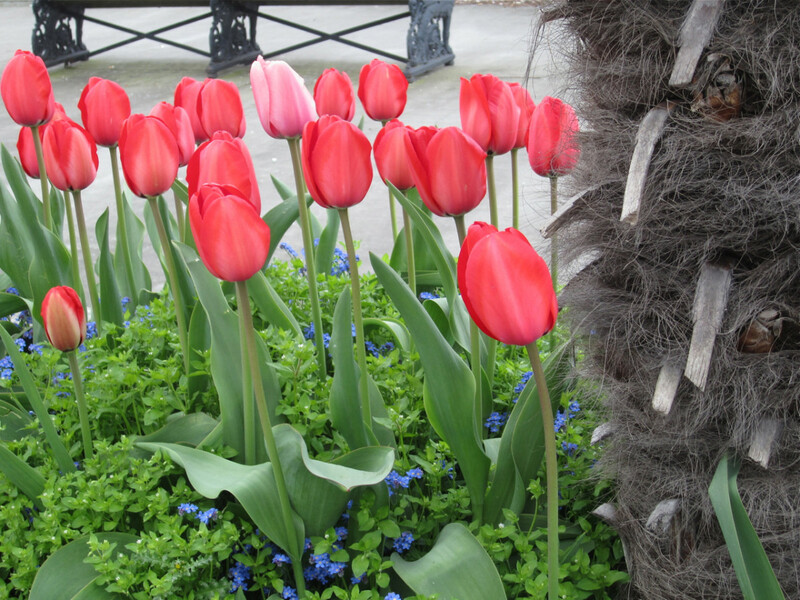 Perhaps there are parks or public gardens near where you live that you could explore. There may be a trail, body of water, or nature display in your area that would be an enjoyable place to visit. Even looking at other people's gardens during a walk could be fun. 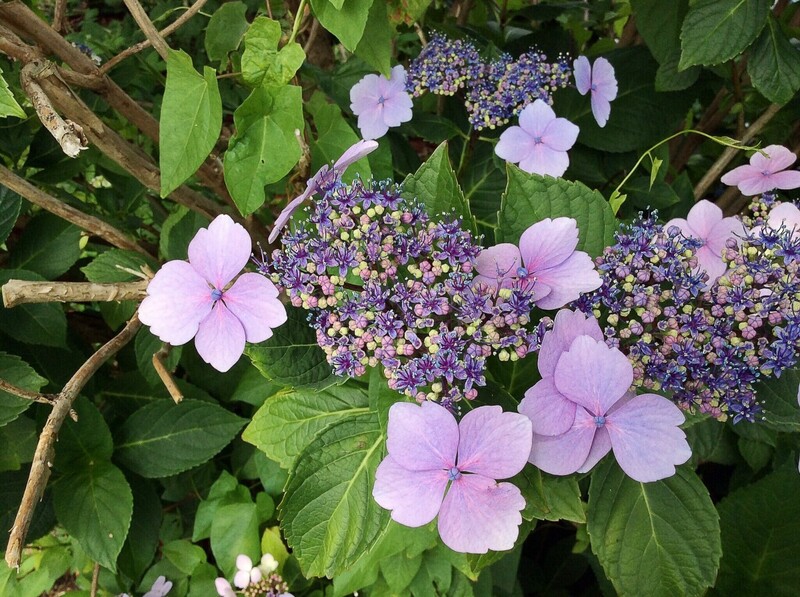 Nature can be observed at any time of year, but the best time may be in the summer. Even in summer, though, the natural cycle moves on. As the season progresses you will see different plants and animals, or different stages in their lives, in the same area. Nature walks are always interesting. The City of Vancouver website has a section dedicated to Stanley Park. The Stanley Park Ecology site has a section dedicated to the heronry. The Vancouver Aquarium website contains some interesting information about its animals and activities as well as facts about open hours and admission prices. TransLink (Greater Vancouver's public transit system) has a Trip Planner page on its site. I would love to go on an Alaskan cruise, freecampingaussie! I hope you enjoy your trip to Vancouver and your cruise. It's very interesting to hear that you found this hub in a travel forum! Thank you for the comment and the vote. Thank you very much for the comment, the votes and the shares, carter06! The park is a beautiful place to explore. Even though I don't live right next to it as Maralexa used to, my home is near enough that I can visit Stanley Park often. How wonderful to live right beside Stanley Park, Maralexa! It would be so lovely to be able to take walks in the park every day. I would love the opportunity to watch the cycle of nature progress throughout the year, too. Skating and cross country skiing in the park sound like fun activities! Thank you very much for the visit and the comment. What a well-written, beautiful hub! Thank you AliciaC! 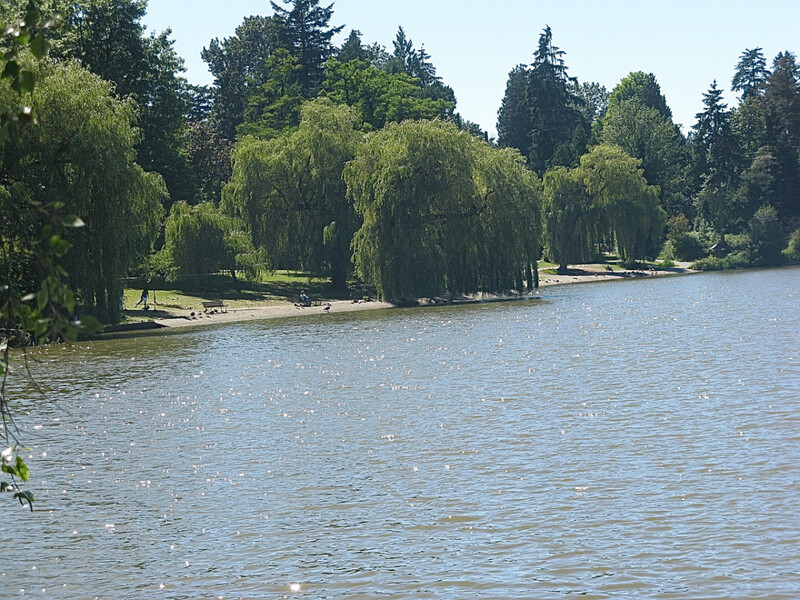 I lived right across the street from Stanley Park (right next door to Lost Lagoon) for 16 wonderful years. You have brought back some wonderful images for me. One year, when it was very cold, Lost Lagoon froze and we could skate over it. We don't usually get snow deep enough to ski in Stanley Park but one year we did. I was able to put on my cross country skis outside my front door and ski into and around Stanley Park. And the walks around the sea wall in the spring, summer and fall -- indescribable! Thanks for this wonderful hub, plus your hubs on Manning Park and Burnaby Mountain Park. You have a new fan! Thank for the comment, the votes and the share, Gypsy Rose Lee! I appreciate them all. Voted up and beautiful. What a lovely park. Thanks for sharing the pictures are great. Passing this on. Thank you so much for the comment and all the shares, Steve!! I appreciate them very much. Herons are beautiful birds and I love to watch them, but I wouldn't like them to steal my goldfish! this is a quality article. I love the video about the Herons and watched it all the way through. I never knew they lived in colonies. I often watch Herons by river banks and they have been known to come and steal my Goldfish from my pond! Sharing this and Pinning tweeting Facebooking and anything else I can think of. Thank you very much, sgbrown! I appreciate your comment and all your votes. I hope you get to visit Stanley Park some day. It's a lovely place. I hope that you have a great day, too! Thank you for the visit and the comment, Kathleen. Yes, I think that British Columbia is beautiful too. I'm very happy to live here! Beautiful British Columbia! I fell in love with in during the four years I lived at Ft. Lewis, WA. Hope you write more on the fabulous place you live. Hi, iamaudraleigh. Thank you very much for the lovely comment and the vote! Stanley Park is a great place to visit at any time of year. This is my boyfriend's dream vacation! Great hub! You should be a travel agent! 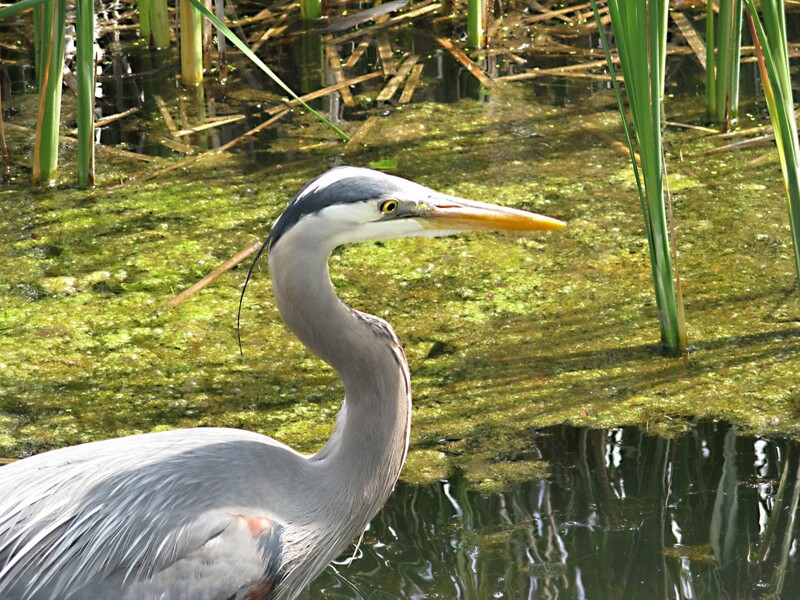 I love the pic entitled, "A Great Blue Heron at Stanley Park"! Voted up and interesting! Hi, Duchess OBlunt. Thanks for the visit and the comment. Yes, Stanley Park is lovely. It's a very enjoyable place to visit, and there are many things to see and do there. Thank you very much for the visit and the comment, kashmir56! Yes, Stanley Park is beautiful. It's a very enjoyable place to take a walk, especially in summer. It's a great park to visit because it provides entertainment for families and tourists, but it's also a wonderful place to observe nature and seashore life. Hi AliciaC, from your great pictures it looks like a very beautiful place to enjoy a very pleasant walk . Beautiful and vote up !!! Thank you, Prasetio. I appreciate your visit and comment. Maybe you will be able to visit Vancouver one day! I would very much like to visit your country. That would be such an exciting and interesting trip! I hope that you have a good weekend too. Hi, Denise. BC does have some beautiful scenery! Thanks for reading my hub and for the comment. Thanks a lot, Rose. I enjoy living near Vancouver because there are many interesting places to visit, including Stanley Park. Vancouver seems like such a cool place - I'd love to go there! 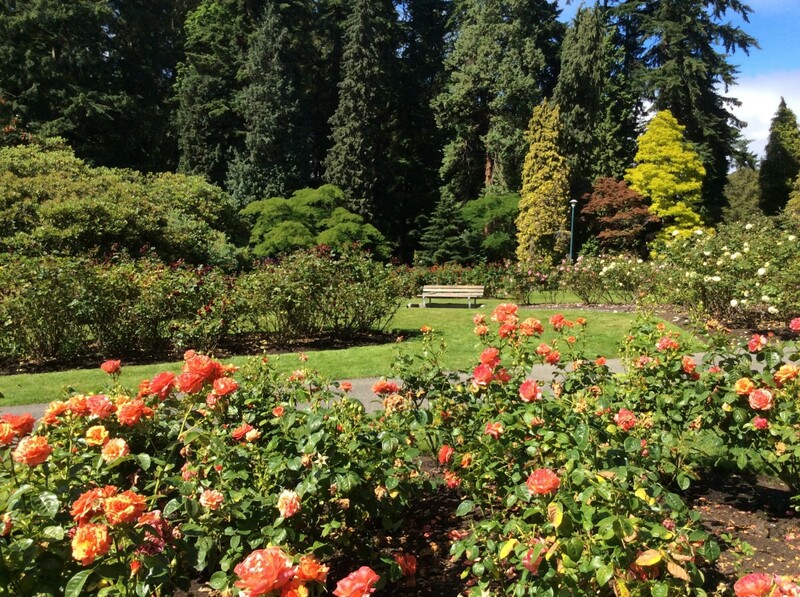 Your photos of Stanley Park are great! Thank you very much, writer20! I enjoy taking photos. I hope that you are able to visit Stanley Park some time. Thank you for the visit and the comment, Carolyn. Fantastic hub, I loved the photos. I'll have to get up there some day not to soon away. Thank you for the comment, Simone. Yes, Stanley Park is certainly an amazing place! Oh my goodness AliciaC! Your photos are so gorgeous! Stanley Park looks amazing. Now you've inspired me to head out and take some photos in my own local parks! Thanks a lot, carriethomson. Shore crabs are so much fun to watch, but they are hard to photograph well because they're small and they move away so quickly to hide when their rocks are lifted up. 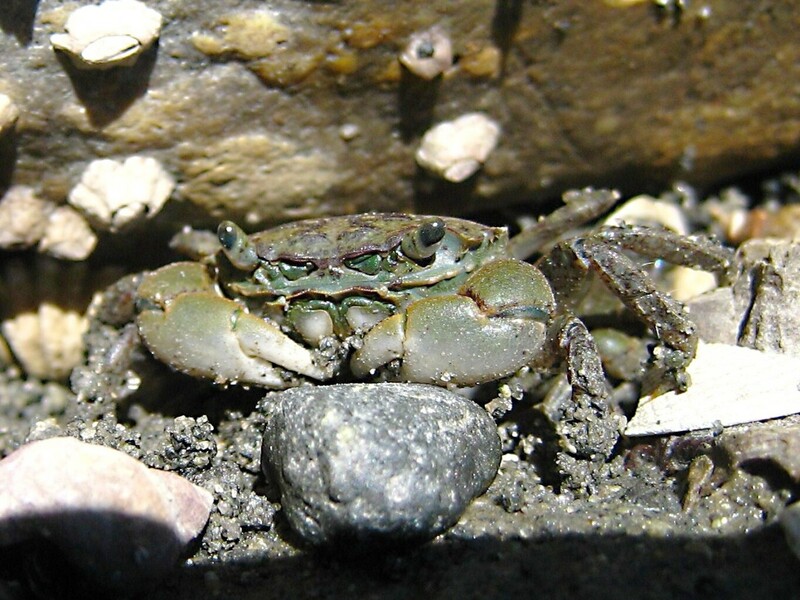 I was very happy to find this close-up photo of a green shore crab. How lovely to get married in Stanley Park, Mrs. Menagerie! That would be a wonderful place for a wedding ceremony. Thanks for commenting. Oh hooray! 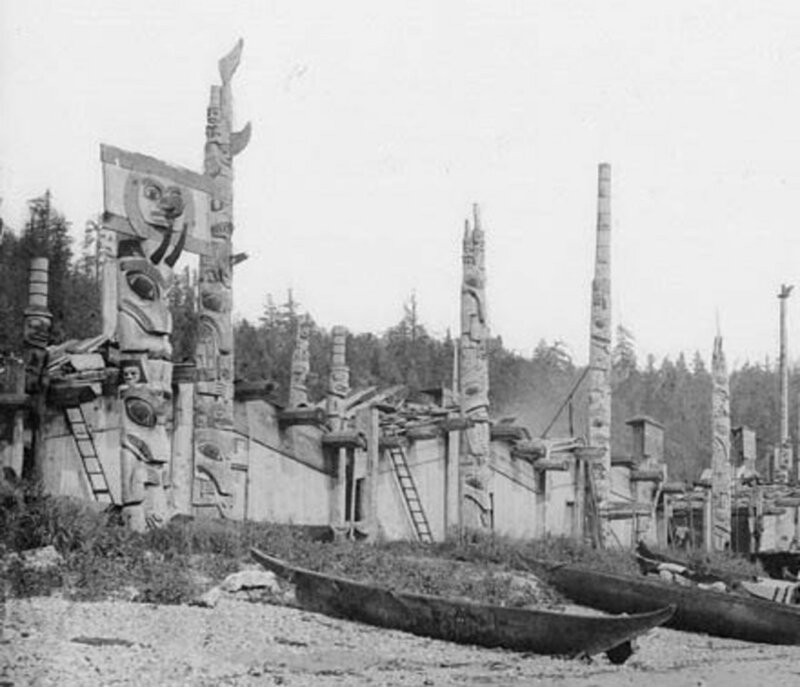 I love seeing the pictures and reading about Stanley Park. I got married there about 11 years ago:) Great hub and great trip down memory lane. Hi, FloraBreenRobison. We have so many great places in nature to visit in our area that it's often hard to find time to go to them all! Thanks for the comment. Thank you very much, b. Malin. Stanley Park is certainly a lovely place for walks and for photography. It's a very enjoyable place to visit. Ooh, it's been too long since we have been down to Stanley Park. -must go nature seeing again soon. What a Wonderful Park to walk in Alicia. Along with your Beautiful Pictures and descriptions I felt like you've taken me there Visually at least in my mind. As always, Thank you for sharing this Interesting HUb. Thank you very much for the comment and for the votes, applecsmith! I appreciate your visit. I love being outdoors too, especially when I am observing nature. Hi, K9keystrokes. Thank you so much for such a kind comment, and for the votes! I enjoy visiting Stanley Park and loved creating this hub. Wow this place looks beautiful! Thank you for the amazing pictures and detail, I love being outdoors. Another great hub you can be proud of. Thanks for sharing - voted up and awesome! Thank you for the comment, Just Ask Susan! Yes, Stanley Park is beautiful. I'm very lucky to live near the park. Stanley Park is beautiful. It has been quite a few years since I have been there but hope to make it back again some day. Awesome hub! and thanks for bringing back some great memories.